My YA gothic novel is published by Sundown Press on May 15. Victorian London is a dangerous city to be alone in at night for 12-year-old orphan, Jack Moon—and his business in those forbidding streets would make a grown man cringe. But his best friend, Danny, has just died, and Jack has promised him a burial in a haunted cemetery beside the woman who cared for them. Living in a rat-infested warehouse, Jack ventures out into the London fog, where he is waylaid by Professor Stackpool, a phrenologist. Can he really read a person’s character by examining their head? He claims Jack is a prime example! But at a public demonstration, he announces Jack is a typical London urchin, destined for a life of crime, and Jack revolts. Benevolent Sir Lionel Petrie and his granddaughter, Olivia, are outraged. To prove Stackpool wrong, the kind judge gives Jack a job at his home. Olivia and Jack become great friends, but something sinister is going on—and Olivia is becoming gravely ill over and over again. Someone is out to kill Jack, but who? And why? When tragedy suddenly strikes, Jack vows to save Olivia, and he is forced to enter the world of séances, ghosts, and ghouls. Will Jack live to bring Olivia back to her grandfather? 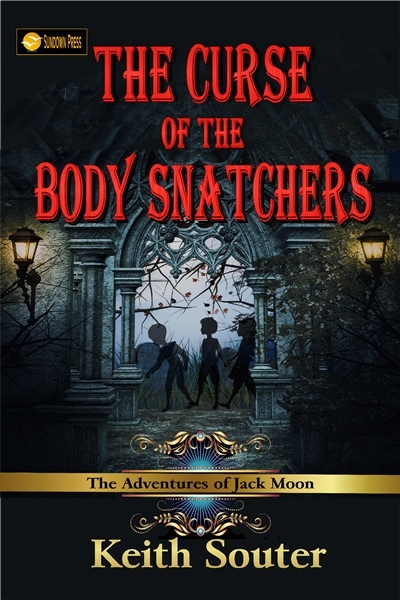 Can they all survive the CURSE OF THE BODY SNATCHERS? Previous WHAT IS THE MYSTERY ABOUT OUR ISLAND?